After recent months of talks, Huawei's sub-brand has launched Honor V10 as the flagship smartphone of this sub-brand. As expected, Honor V10 looks like a rendering that has been leaked before, which comes with a display 18: 9 which is currently a trend. Can be seen, this smartphone has a bezel that can be said thin where it makes the look of Honor V10 looks more luxurious. This smartphone has a 5.99 inch wide screen FHD + resolution and of course with 18: 9 aspect ratio. Bodinya made of modern metal and appear in a charming blue color. Although comes with a full-screen design, but Honor V10 still has a home button in front that also functions as a fingerprint scanner. Shifting to the hardware side, the smartphone is powered by Kirin 970 chipset that can be found also on Huawei Mate 10. The chipset has a special Neural Processing Unit (NPU) that can handle AI. This phone is said to have visual, auditory, learning, cognitive, computing, and decision-making capabilities. Even this device also has the ability to identify up to 33 images per second and bring 25 times the performance increase when compared to the previous generation chips. 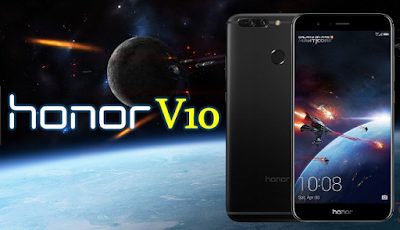 Honor V10 is available in three memory options, namely basic variant with 4GB RAM + 64GB ROM, medium variant with 6GB RAM + 64GB ROM, and highest variant with 6GB RAM + 128GB ROM. This smartphone is running the Android operating system Oreo already wrapped with customization EMUI 8.0. Not to be missed, Honor V10 also packs 3750mAh battery is also supported by super fast charging 5V / 4.5A. About photography, this smartphone has been equipped with dual camera setup on the back. Dual-camera is composed of 16MP + 16MP which is equipped with LED flash. While for the selfie can use front camera 13MP resolution that has AI support. Honor V10 comes with color variants Magic Black, Aurora Blue, Gold Beach and Charm Red. Talk about the price, the cheapest variant will be priced at 2699 Yuan or equivalent to Rp5, 5 million.